Digital and connected radio specialists Pure has announced the launch of a new internet radio iPhone app to let users access its 'Lounge' online radio portal on the go. It is the first app of its kind from Pure and is sure to appeal to anybody with a desire to find and share some new online radio favourites to listen to either at home or on the bus to work. 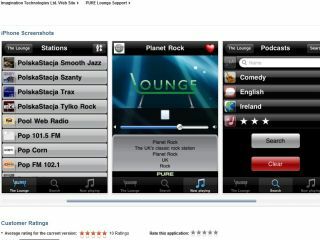 Pure's connected radio range already allows users to access its radio and media portal, the Lounge and the new app "enables iPhone, iPod Touch and iPad users to listen to a world of internet radio, podcasts, listen again content and a library of unique and ambient PURE sounds, on the go." Pure's press release promises: "The Pure Lounge offers the user a world of local, national and global radio content ranging from American country to current events in Poland and from Gaelic football results to Austrian hip-hop. "Listen again content allows users to catch up with radio programmes that they've missed such as the latest episode of the Archers or Dave Pearce's dance anthems on BBC 6 Music. Podcasts available on the Lounge give users access to thousands of programmes available anytime whether its bedtime stories for the kids, DIY tips or highlights of a favourite breakfast show." The app promises iOS fans access to audio 'seamlessly' whether you are on a Wi-Fi connection or a 2G/3G connection while out and about, allowing users access to "the Lounge's powerful and simple to use search filters and find the content they want." You can search for radio stations using any combination of name, language, country, genre or audio quality to sift through the tens of thousands of stations on offer out there in the ether. You can grab Pure's new Lounge app from the iTunes store in the UK right now for £2.99.